The Santorini Seismic Experiment is using seismic methods to examine the entire crustal magma plumbing system beneath Santorini volcano. Santorini is unique for this study because it recently experienced significant unrest; inflation of the ground and intense earthquake swarms during 2011-2013. It is also geologically well-studied. It is an ideal location because is a semi-submerged volcanic system which makes it possible to collect dense 3D marine-land seismic data. During the research expedition, we recorded 14,320 sound sources from the US R/V Langseth on 93 short period ocean bottom seismometers and 65 land seismometers. Read the UO web article about the research expedition: UO-led expedition probes undersea magma system. Read our Blog for posts made during the research expedition. Santorini provides millions of dollars to the Greek economy annually, and any renewed volcanism and/or seismicity would not only impact the communities on Santorini and the neighboring islands but also have a substantial economic impact. 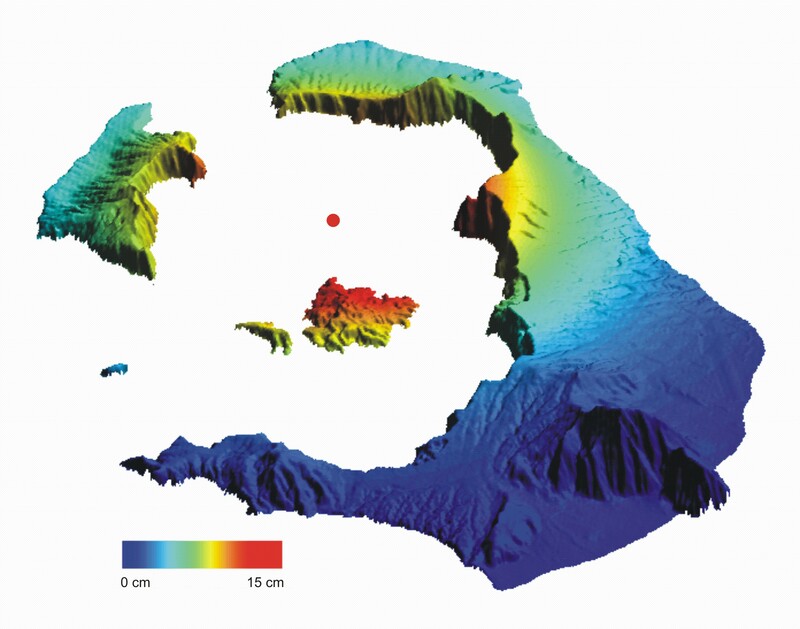 This research will inform the Greek public and civil authorities about volcanic, earthquake, and tsunami hazards and would help inform disaster management planning. The high-density spatial sampling of the seismic wavefield and state-of-the-art travel time and waveform inversion methods will provide new insights into the structure of the whole crustal magmatic system and its surroundings. This will allow the scientists to determine the magma geometry and connections throughout the crust – physical parameters that control magma migration, storage, and eruption and are thus important to understand geohazards. More broadly, this study will also help scientists answer questions about how the processing of magma at arc volcanoes forms the rock compositions that dominate the continental crust.